Postcard from a series on the Armies of the European War of 1914. The French Army included units from its African colonies including Morocco and Senegal, and the Départment of Algeria. 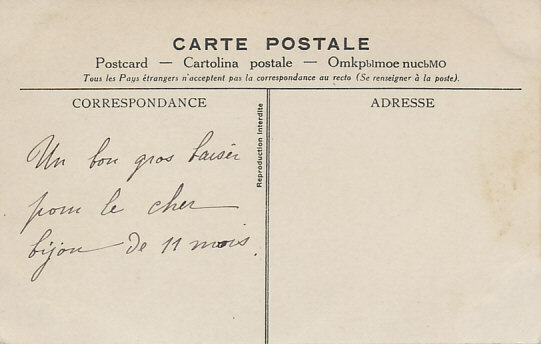 Un bon gros baiser pour le cher bijou de 11 mois. A great big kiss for the dear jewel of 11 months. Algeria was a French département, considered by France in integral part of the country rather than a colony. On August 4, 1914, two German battleships of the German Mediterranean Squadron, Goeben and Breslau, which had been in the Mediterranean since the First Balkan War in 1912, fired on the French-Algerian ports of Bone and Phillipville. 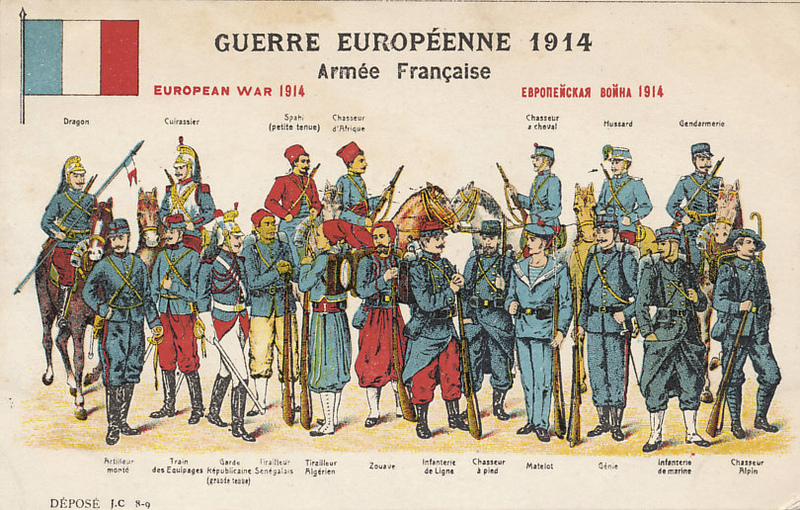 The French Armée d’Afrique, the Army of Africa, consisted of troops from Algeria, Morocco, and Tunisia. Native Arabs and Berbers were typically light cavalry or infantry - spahis and tirailleurs. French settlers typically served as Chasseurs d'Afrique or Zouaves - again, light cavalry or infantry. As many as 100,000 Algerians died in the war, fighting for France on the Western Front, in the Middle East, and on the Salonica Front. In the last, the spahis played a crucial role in the defeat of Bulgarian forces, moving through the mountains to take the Serbian cities Veles and Skopje. Algeria is a colony in Africa.